From New Brunswick we headed across the 8 mile long Confederation Bridge which since it’s opening in 1997 has opened Prince Edward Island (PEI) to easy accessibility, something that was actually put to a vote by the citizens before construction could begin! At the visitor center we discovered that at least for tourists, the island is “divided” into touring sections, Points East Coastal Drive, Central Coastal Drive and the North Cape Coastal Drive. Having now done a lot of it, they do indeed each have a different feel to them. The one thing that is very consistent however, are the colors of PEI: RED ~ GREEN ~ BLUE. Crossing over the bridge deposits one on the southern Red Sands Shore of the central section where we headed east following the mapped coastal road (it varies from 10 to Trans Canada Highway to 19) arriving at the cute town of Victoria just about lunch time. The Lobster Barn Pub & Eatery had those magic words lobster and pub so of course in we went 🙂 Put it on your list if you get this way…YUM! Continuing on along the coast to just outside of the capital city of Charlottetown we headed northwest towards New Glasgow Highlands Campground where we had reservations for the next couple of nights. 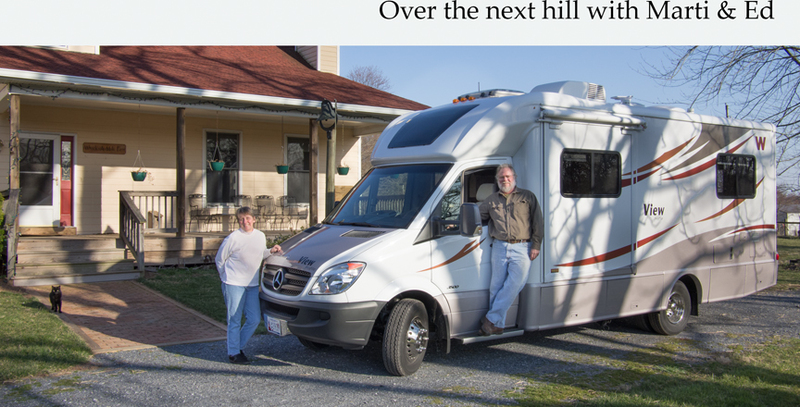 Fellow RVer’s put this place on your list, not only is it private, pretty, and have all the amenities, we can’t say enough about how wonderful the owners Marlene and Les are. It’s never a good thing to hear a loud “BANG! !” come from the rear end, but we knew right away what it was and actually had the spare part. The wonderful campground owner, Les Andrews let us park in front of his garage, loaned us his pump jack, some extra tools and a roller cart so Ed could replace the sway bar bracket that broke in two places. Welcome to the people of PEI! The red (due to iron-oxide i.e.rust) sandy soil of PEI, the warm summers, cold winters and moisture retaining ability of the dirt is perfect for growing potatoes. In fact it is so perfect that they are the top producer of excellent spuds in all of Canada. With our visit coinciding with spring, the turned, hilled red earth of the potato fields in the surrounding, incredibly green rolling countryside was quite unlike any other landscape we’ve seen. This is as close as we got to capturing the ethereal green, rich red and deep blue of the sky. It doesn’t come close. Blue is also the color of Prince Edward Island, water and sky. To the north is the Gulf of St. Lawrence and along the southern shore the Northumberland Strait. Scattered all about are streams and rivers flowing out the many fingers into the coves and bays which form the picturesque harbors for the many fishing vessels that produce PEI’s other main crop, shellfish. While lobster is the main crop they also farm oysters and their famously delicious mussels. Unloaded and headed for his slip. Oysters and mussels are extensively farmed in the cold, clean and quiet waters of PEI’s coves and rivers. …and we did our best to help the local fisherman. This was at The Blue Mussel Cafe in North Rustico where we sat on the rooftop deck. Put it on your MVL. We drove up the North Cape which is heavily Acadian. Acadia, (New France) was the colony settled by the French in Northeastern America as early as the mid 1500’s. By the mid 1700’s and years of fighting with the English the Acadians were forcibly removed or fled to among other places Louisiana and New Orleans, hence the strong Acadian (Cajun) influence in that area. The history of the Acadian people in this whole region is rich with strife, suffering, conflict and compromise which was just finally completely settled in 2003. We leave it to you to do some very interesting reading. The North end of the island has very few towns or people. It is considerably more flat and we did not find it nearly as pretty, but our visit to The Wind Energy Institute of Canada was interesting. When you see those big windmills with that little thing on top? This is that thing and it’s called a nacelle. It is where the spinning motion of the blades is converted to electrical energy and sent to the main power grid. Each of the three blades attaches to the hole behind Ed. This is a single blade. It is 90 ft. long. We stopped at Cedar Dunes Provincial Park to see the West Point Lighthouse where we enjoyed seeing the small museum as we climbed to the top. On the backside of the West Point Light is a two storey arm of hotel rooms. You can also stay in one room in the lighthouse, but we saw the room and it ain’t worth the money and doesn’t feel like a lighthouse. Nobody bigger than Ed is getting through this hatch into the lightroom at the top. We had thought to spend the night at Linkletter Provincial Park but with the recent rains it was a bit of a swamp so we chose not to and headed back to New Glasgow Highlands. Next morning we headed east on the coastal road crossing into the Points East section of the island. We took the short side trip to Red Head Harbor on St. Peters Bay and the prettiest harbor yet. Directly across the bay is Greenwich, PEI National Park where we did the fabulous boardwalk trip out to the shore. Put this in on your MVL (Must Visit List). One of our prettiest walks ever. The boardwalk floats across the large shallow pond behind the dunes. The squawking and carrying on as they dive bombed for dinner was one of the coolest things Marti ever saw. Our last morning we ate at the Blue Fin in Souris where Ed ordered the Hungry Man Breakfast and it was more than he could finish. Continuing down the coastal road to Charlottetown we walked around the old section and stopped for a drink and shared a good lobster dip at the John Brown Richmond Street Grill. We like this town and it would have been fun to spend more time poking around. This street is closed to traffic during the season and we were there just in time for the beginning of the season. Down here is John Brown Richmond Street Grill. Ed and I have heard nothing but rave reviews about Prince Edward Island for years and we are very happy to have spent a week seeing the sights. We met many friendly people, saw gorgeous farm country, quaint harbors, lots of lighthouses and had some very good seafood. No trip to the Canadian Maritimes would be complete without a tour of PEI, and yet we don’t feel the desire to explore it further. Can’t say why, just the way we feel. That being said we’re sure most folks will love it, especially the Central Coast so do put it on your MVL! Victoria, a small and very quaint fishing village in the Central Coast region. and a similar scene in Red Head Harbor. Red sandstone cliffs eroding creates the red beaches and muddy waters. This buggy parked outside of Green Gables has a straw hat with red braids attached for tourist to put on and pretend they are Anne. No. In Green Gable’s kitchen is this wood stove which is pretty rare and very low to the floor for heating. Walking off that chowder and mussels lunch in North Rustico. There are churches everywhere on PEI. Almost all of them are classically, exquisitely beautiful, all with tall steeples. St. Patrick’s Roman Catholic Church. The coming and going of the workboats and the expert skippering of them is a real ballet on the water as they come in to unload their lobster catch. … and then there’s kids being kids at Northport pier. That water was really cold, they practically bounced off it screaming, “Cold, cold, cold!!!”. But five minutes later they did it again. Lobster boats coming in is just a classic PEI scene on the water. We were told that a commercial lobstering license trades for approximately $1,000,000. The government only issued so many and they only become available as a waterman retires and has not passed it on to his heirs. Unlike, the USA, there is a season for fishing lobsters, cod and snow crabs. With lobster at $7 a pound at the dock the men are currently doing pretty well. Green, red and blue. Oh, and dandelions are EVERYWHERE! This is designated a Heritage Farm and we think it’s because they grow the best dandelions. No kidding, this scene repeats itself everywhere on PEI. We have never seen so many dandelions. Along the floating Greenwich Boardwalk. Marti found some broken lobster trap bits. The rectangular openings are intended as escape portals for little lobsters who used to get attacked and killed by the bigger lobsters who were also caught in the trap. Really. BTW, Marti wants you to know those bumps in her pockets are water bottles and not rocks, which she is reputed to pick up. The day is done at Northport Harbor. The watermen make an extremely hard and dangerous job look so easy and fun when the weather is pretty. Most of us wouldn’t last a half a day. The view from atop the West Point Lighthouse. Ed, your bus driver doing half his job. His other job is bartending and Marti says he’s very good at it. We will catch you on the next province, Nova Scotia. The beautiful island scenes and a blog rich in imagery entices one to head east this very instant. The lobster, however, is the real draw. Yum. We had our bar break in California winter before last and know that sound. When it happened, Hellwig sent us a bracket kit that had two brackets and being the smart cookie I saved the extra and hardware. I think the roads up here are just terrible and I hit a hole as I braked suddenly and it just broke. I am almost ready to say Hellwig’s hardware is a weak link in the chain. Enjoying your Ed and Marti adventures….. always a joy to read and see the beautiful images. Definitely adding many places to our MVL! Such beautiful photos! Thanks so much for the “MVL,” Ed and Marti. I’m taking good notes! Once again you really, really did a great job with all the fabulous pictures and narratives. We live such a closed sheltered life after seeing all of your travels. We definitely feel like we are traveling with you. Thank you Judy. We love that folks enjoy our adventures too!! Thank you so much for continuing to share your wonderful travel. You are very welcome! Glad to have you along! Maybe, but some people I know really are crabby. Thank you Anne! Marti and I always think of you and Chet when we see neat birds doing something fun.